Super Bowl food tends to be pretty unfussy stuff: chips, wings, anything that can be served in a plastic bowl and consumed by the hundreds. But at last night’s Taste of the NFL event, the fare skewed a little more highbrow, as celebrity chefs from 32 NFL cities, each paired with hometown star football players, descended upon Brooklyn Cruise Terminal’s Pier 12 for a 3,000-person strong foodie extravaganza. “I love the Food Network!” gushed Miss America (also known as Nina Davuluri), decked out in full pageant regalia. She and the other VIPs — who included a gaggle of Food Network personalities and celebrity chefs — had just arrived via yacht, where they were greeted at the red carpet by a line of beaming cheerleaders. “Touchdown!” cried the cheerleaders, swishing their pom-poms aloft. Among the famous foodie crowd was Adam Richman, the former host of Man V. Food, who took time to situate himself on the Approval Matrix for us. “I’ve always thought I’d be brilliant and lowbrow,” he offered. The native Brooklynite emphasized the local impact of the event — 30 percent of the evening’s proceeds would go to local hunger relief organizations including Brooklyn’s Bed-Stuy Campaign Against Hunger — while reflecting on Kings County’s evolution into a culinary haven. “My hometown that was home of the egg cream, and the soft pretzel, the knish, the kosher deli, all of a sudden this stuff is all emulsions and foams and gastriques,” he said with a laugh. 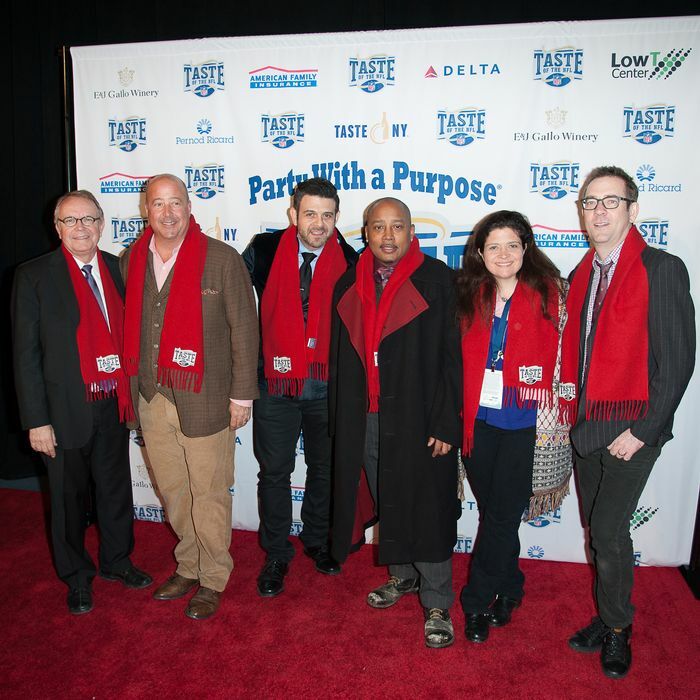 The evening’s culinary hosts were Andrew Zimmern of Bizarre Foods and Ted Allen of Chopped, both of whom emphasized the importance of the event’s local efforts. “It’s totally local. The majority of the money that they raise here will go to New York and New Jersey hunger-relief organizations. Especially with the SNAP cuts that happened a few days ago, it’s more important than ever,” said Allen, a Clinton Hill resident, who copped to knowing “zippo” about football. “It’s funny cause I meet all of these NFL hall-of-famers and I don’t know who they are. It’s the pot bowl, as far as I’m concerned,” he said, referring to the recent changes to the marijuana laws in Washington and Colorado. Between tastings, attendees queued up for footballer autograph signings and placed bids in the silent auction. Seattle chef John Howie served up Skuna Bay salmon with sticky rice and coconut Thai curry sauce alongside former Seahawks defensive tackle Craig Terrill, while one booth over, Denver’s Troy Guard offered bison and pistachio sausage accompanied by Hall of Famer Floyd Little. “It’s bison, but we say it’s Seahawk sausage,” joked Mr. Guard, although the spirit between the two Chefs was largely amicable — if not necessarily the mood of all the guests. “I don’t like Seattle, I’m not eating their food,” one woman commented as she passed.